To create your own bootstrapper package for use in a ClickOnce deployment may seem overwelming at first. I have created and put into production several custom bootstrapper packages. What is the advantage to creating your own bookstrapper package? If you have a piece of your program that needs to run once using administrator privileges, you don't want to make your whole program ask for elevation when it is not needed. To make a cleaner program, split that piece of code out into it's own exe or dll and make it a prerequisite of your main program. I will modify my XML files with a free program called Notepad++. You can download it from Notepad ++ Make sure that you start the program "As Administrator". If you do not, any changes you make will not be saved properly. [step="A" title="Folder Structure"][/step] The first thing you need to do is open Windows Explorer with Administrative Rights. Browse to: C:\Program Files (x86)\Microsoft Visual Studio 8\SDK\v2.0\BootStrapper\Packages Please note that your path may vary depending on if you are running on a 64-bit or 32-bit system and which version of Visual Studio you are running. There will be several folders that were installed with Visual Studio. You can copy and paste or create a new folder. 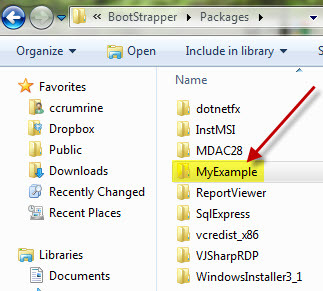 I will create a new folder called MyExample. Inside of my folder, I will need to add an XML file called product.xml and another folder called en. Inside of the en folder, I will need another XML file called package.xml and my program. You will notice that I have not included the eula.txt for this example. If you wish to have the user agree to a EULA before installing or running your program, you will need to include it here. You can copy one of the folders that already exists and simply modify the XML files if you would like. [step="B" title="Product XML"][/step] Open the Product XML. If you want to make sure other packages are installed before your program runs, add them as a DependsOnProduct. In this example, I want the Framework 2.0 and the MS AccessRuntime installed before my program runs on the system. [step="C" title="Package XML"][/step] Open the Package XML. Change line 8 PackageFile name to TrustedLocation.exe (or the name of your exe or dll). Change the homesite to the name used on line 50. This can be anything you like but it must be the same on both lines. Change the Command PackageFile name on line 13 to TrustedLocation.exe Change the Estimated Installed Bytes to the approximate size of the exe. This is used to calculate the remaining time during the install. It does not have to be accurate but gives a better user experience if it is accurate. You should not have to change any of the install conditions or exit codes. However, if you would like to customize your conditions, here is where you can do it. The strings section starting on line 37 will supply any of the messages seen by the end user. The first entry, on line 38, will be the Display Name. This name will show in your Visual Studio Prerequisites. The next entry, on line 39, will refer to the language and folder you created earlier. The next entries will contain messages for the conditions and exit codes in the previous section. The last entry, on line 50, will supply the location of the trustedlocation.exe. I will come back to this later on. First, open visual studio and open your program. Right click on the project and select properties. 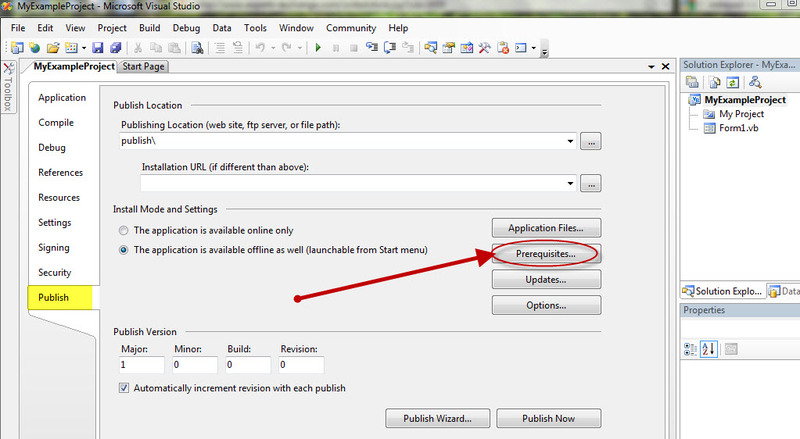 Click on the Publish tab and click on the Prerequisites button. You will now have "My Trusted Location" as a prerequisite. 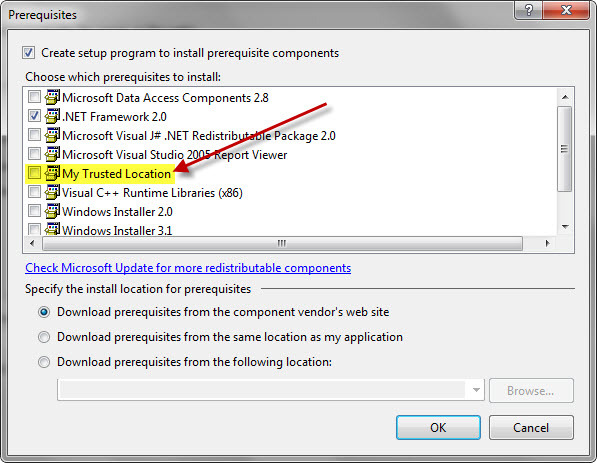 Notice the section at the bottom titled "Specify the install location for prerequisites". If you choose "Download prerequisites from the component vendor's web site" the program will be downloaded separately from your deployed program from the site specified in the Package XML line 50. If you choose "Download prerequisites from the same location as my application" the program will be downloaded along with your program. You will want to use this option if you are creating a CD.